It’s only Tuesday, and I’ve already had the best week ever. 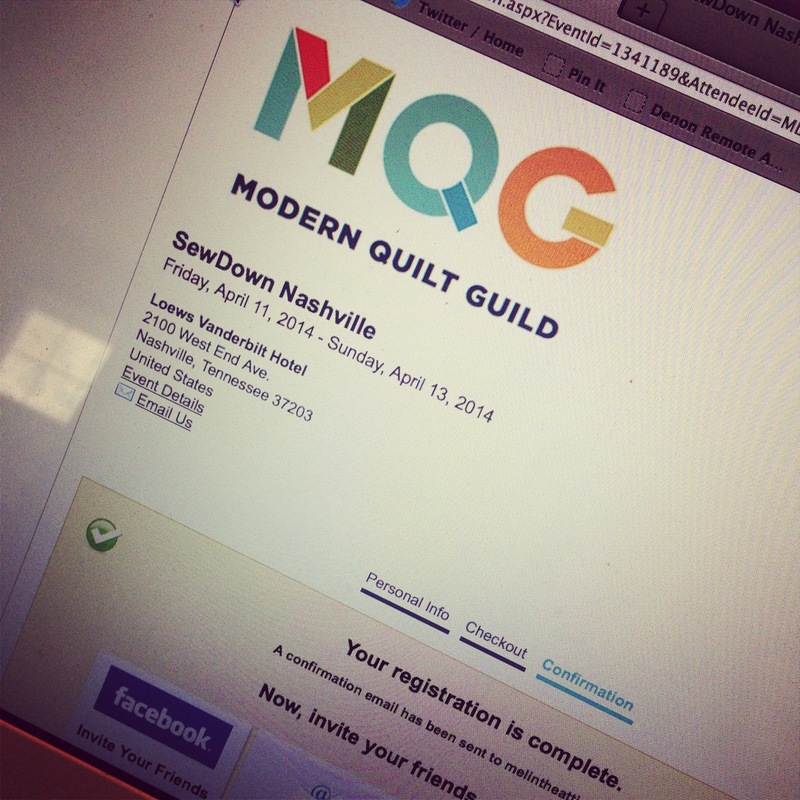 I was nervous about registering for The MQG’s SewDown Nashville all weekend, and with good reason. The class lineup includes a few of my all-time favorite quilters and a tour of Anna Maria Horner‘s home studio. So I camped out by my computer and signed up the second I could. In the meantime, some people got a screen asking them to log in, and so many people tried to register that it sold out within two hours. Now how to wait five months to take all the classes and hit Nashville with the six other NJMQG members who signed up? I’m feeling pretty fortunate to have the opportunity, means and luck to get in. 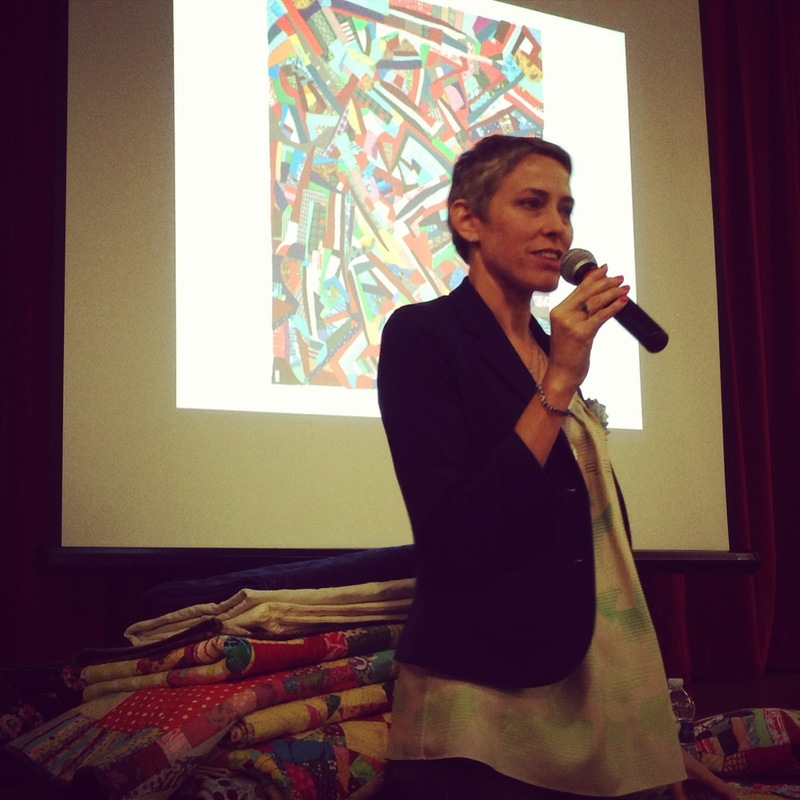 Then, all riled up on quilt excitement (yes, that happens sometimes), I got to go see Victoria Findlay Wolfe speak at the Garden State Quilters meeting. the GSQ generously offered NJMQG members free admission to the lecture. It was so inspiring, especially after the evolutionary process of my brick quilt top, to hear about how Victoria’s quilts evolve. I have a long way to go to get to the wow factor of her quilts, but I found so much energy and some good ideas in her work. 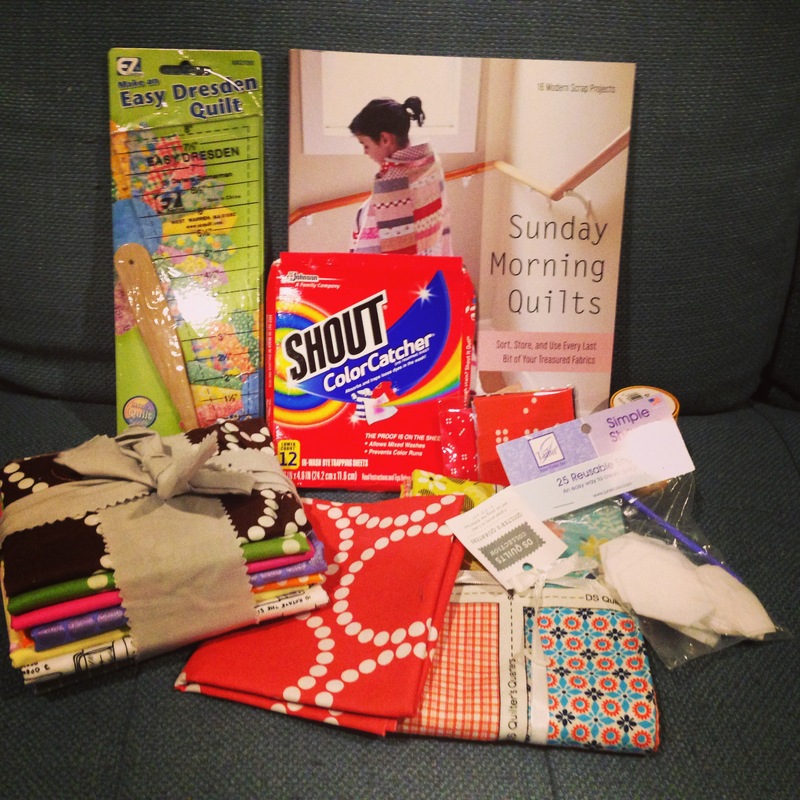 And though I won Cath‘s blogaversary giveaway last week, my package arrived today. There is so much fabric! And some tools, like hexi shapes for English paper piecing and a Dresden plate ruler. Victoria Findlay Wolfe said, “make the quilt you said you’d never make,” and those were definitely on my “never” list. Now I’m amped up to try them. Because of all the good things that have come my way lately, I want to give something back. November is the month to be thankful, and I am so thankful for everyone in the quilting world that has inspired and encouraged me. So I’m giving away two bundles of fabric totaling about two yards each. There will be fat quarters, half yards and scraps in a range of colors. Leave a comment on this post about what inspires you lately by Friday, November 15 at 10PM EST and I’ll pick two winners with a random number generator. Melanie, you deserve all the good things coming your way!!! I have been too busy to let inspiration creep in – could not lose my focus last month – but hope to get reenergized when I get back from my trip! And can’t wait to go to Nashville with everyone! Fun Fun Fun! You do deserve all things good! Flying geese patterns are inspiring me right now! Thinking that might be a good way to use up all the scraps of my running over basket ! Love your brick top quilt! Thanks Anne! Thanks for visiting. Thanks Aubrey! I love your quilts. Currently, I am inspired by all the creativity I see–the art you are doing, the art of my friend Rebecca and her quilts and the amazing way that colors, patterns and images are all linked together to make something totally new. It has spurred me to get out my paper and start designing cards again. A quilt is still on my someday list, but I am inspired by Victoria Findlay Wolfe’s words and am trying to figure out how I can make that a reality. Thanks for your posts, Mel. I’m inspired by bright colors. Congratulations on your giveaway win. What a fun package to receive! Thanks! And thank you for commenting. I love bright colors too. I’m totally jealous that you get to go to SewDown Nashville! I’d love to go some year. I’m definitely inspired by the quilts of other bloggers. I’m new to quilting and still really trying to find my style and it is so fun to see what everyone else in the quilting world is doing! Amen! Thanks so much for your comment. I definitely will! I can’t see where your scraps take you. I like your style. Thank you so much for this great comment, Kari (I’m a little behind on replying). I hope to see you again too! What inspires me most right now is the imagination of my fellow bloggers, who continue to make colour and fabric choices that astonish, awe and satisfy my eye. So many ideas that would never have occurred to me, so many busy hands shaming me into finishing up or starting where I’ve been putting it off… I’m grateful for the community, the appreciation, the support, and most of all, for all the colour in the world.